Baking for Idiots – Helping normal people make nombly noms! Helping normal people make nombly noms! We must start with yet another apology for the catastrophically empty blog. Month after month without a peep from us at the ‘Baking for Idiots’ kitchen. Luckily for us this meant employment elsewhere, but the summer has arrived, as has an empty schedule, and the ‘Baking for Idiots’ kitchen is back! The Great British Bake Off starts in 3 days time!!!! So plenty of baking mishaps and masterpieces to keep us inspired on our summer baking bonanza! The ‘Baking for Idiots’ kitchen has been swelteringly hot the entire summer (unpleasantly so) yet we decided to reignite our baking brains with something not too ambitious. The decision…? Cookies! Well, Delia’s Chocolate Orange Biscuits. Oven on, ingredients mixed, everything going perfectly. Unfortunately we only own one baking tray.. should get another.. and it wasnt clean, so 2 smaller roasting tins were used instead. This did not cause issue, it was more the slightly less than ideal spacing left between the biscuits that caused a cookie-cake result. Not to worry as once removed from the oven and left to cool on the greaseproof paper they were baked on, we simply followed the wiggly joining line of the cookies with a knife, and wonderful :). So not quite bake sale presentable in shape, but tasted scrumptious and were perfect with a cup of tea. Apart from the rookie error, we can very much recommend these biscuits. nom nom nom….. The only question left? What next? We shall see what whiff of inspiration is blown our way so we can try and de-murkify the baking waters for those like ourselves, with bags of enthusiasm yet a slight lack of magic built-in know-how. Just a quick post to say that all is well with us however both being musicians means that sometimes life gets a bit manic and you end up running around going from gig to gig without weekends or evenings or any time at all off! These last couple of weeks have most definitely been a bit like that for both of us but rest assured, baking (and blogging!) will most definitely recommence soon. I will leave you with a music related video to watch, really worth watching the whole thing. The unbelievably good Mnozil Brass who are well worth investigating, absolutely extraordinary musicianship as well as showmanship! Enjoy! This recipe is without a shadow of a doubt one of my favourite things to bake and eat. It is simple, straightforward, cheap, easy, delicious and best of all; you probably already have all the ingredients! The sheer squidge-nosity of this pud will leave you jumping for joy and melting in utter bliss at its fruity delights. Some people apparently like it hot with custard, I however like it cold and served with a cup of tea. How you enjoy it is your call but please do give it a go! 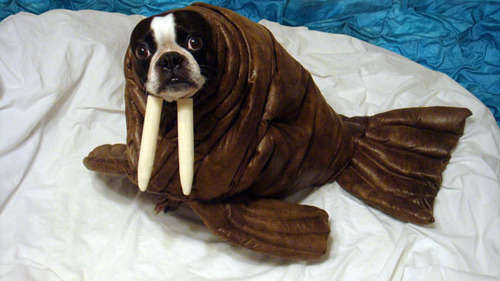 This is where there would normally be a photo of the finished product but unfortunately I ate it all before remembering to take a photo so instead, here’s a picture of a dog dressed as a walrus. 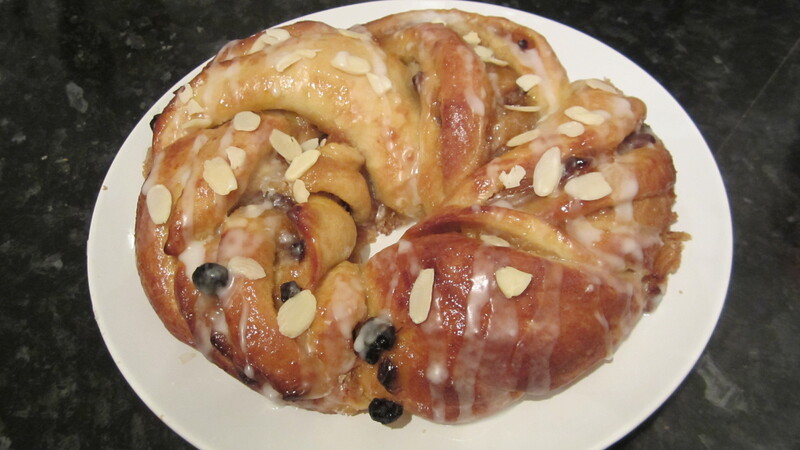 Sunny Apricot Couronne, GBBO Inspired! The weather outside has well and truly changed for the worst and the ‘Baking for Idiots’ household has been struck down by a severe case of man-flu. This next bake was a desperate search for a little sunshine to breakthrough the gloom, and the answer came in the form of an Apricot Couronne. This was the obvious answer, with its sunny, apricoty and fruity sweetness. I had no idea how to make one, but again the Great British Bake Off inspired me to try and it seemed a worthy task to round off National Baking Week. I had never made anything even vaguely similar, so set off equipped simply with Mr Paul Hollywood’s guidance and as always, bags of baking enthusiasm. Its National Baking Week, so we could hardly let it go by without trying our hands at something new, exciting and unknown. Unknown bakes may be slightly easier for us to find than most, being far more qualified in the nombling department, however, we shall guide you through our first experience with this particular classic! Gym trips complete, and therefore all guilt erased, we started work on this wonderful bakewell tart. Of course we did the usual, and traipsed the net and our (somewhat limited) supply of cookery books, for the elusive one true recipe that would lead us to instant baking perfection. Needless to say such did not exist, as everyone seemed convinced that theirs was the ideal. So many tiny variations, for essentially the same thing! The result? We picked and mixed and added our take to the bunch with the Baking for Idiots’ Bloomin’ Brilliant Bake of a Bakewell! Fed up of reading extra words, click here to go straight to the recipe! After a stressful week I finally found myself with a free afternoon, and decided to utilise this glorious batch of emptiness in the best possible way; by baking some English Muffins. I must say, it was definitely inspired by my programme of the moment- the Great British Bake Off. I searched far and wide for muffin recipes, noting their differences and eventually created the ‘Baking for Idiots Monkey Muffin Method’. You would think that after watching the trials faced by these talented bakers I would be put off by such a culinary challenge, but no… I bounded on into the unknown with the enthusiasm (and unfortunately, also the skill) of an excitable Labrador. Afterall, how hard could it be?! Hello, if you really don’t want to hear me waxing lyrical about this Lovely and Lusciously Layered Lemon Cake then click here to go straight to the recipe! So that was a fairly weak subheading, apologies for that. However I think we may have something for you to bake that will definitely make up for it! We made today’s nombles as it was a relatives birthday and they don’t like their desserts too sweet or chocolatey, so this cake was right up their street! Light and and airy with just enough Lemon tart-ness to add some extra zip to the taste, this cake ticked all of our boxes and we are sure it will be a firm favourite with all our readers too. 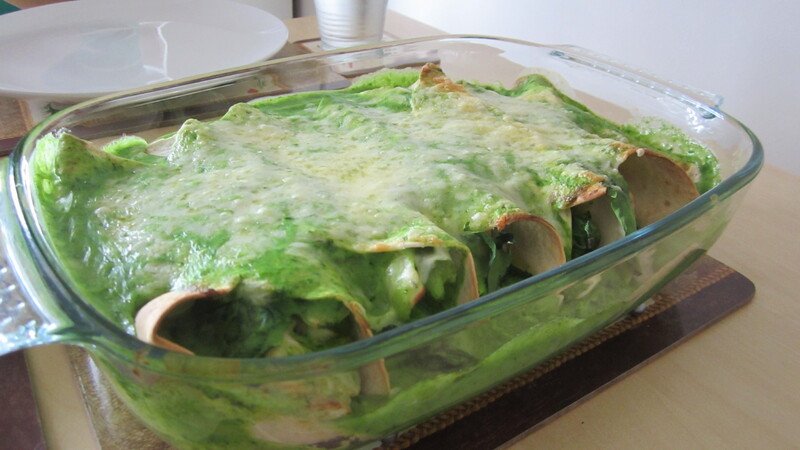 Enchiladas with a delightful Green twist! …are almost certainly the food of the gods. Combining elements of the all time greatest things (Lasagne, Mexican food and the colour green) into one swirling melting pot of delicious-nocity. This recipe is one we stumbled upon from the From Scratch Club blog (which is most definitely worth looking at). So this is our first post. We’ve just eaten something that was very delicious but unfortunately didn’t document the process so will have to return to it another time! Yes, culinary idiots. That is why we are here, trying to improve. We never got taught how to make good food so we’re having to figure it out for ourselves. That is alright, life is too short to be resentful. Idiot. So when will you actually post a recipe? Soon! Very soon. Honest. Imminently. Any day now. That’s all for now! Hope this blog is useful to somebody out there one day.